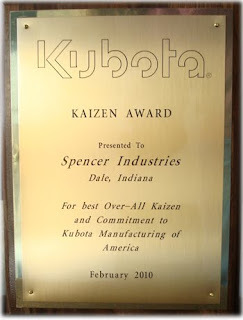 Spencer Industries Inc. received Kubota Manufacturing of America’s Kaizen Award for the best over-all Kaizen and commitment to Kubota Manufacturing of America. This award is based on an eight month competition between Kubota suppliers to improve processing and reduce the cost of not only Kubota components that Spencer Industries Inc. produces, but an overall commitment to the Kaizen philosophy of process improvement. To further utilize the Kaizen approach in their overall manufacturing process, Spencer Industries Inc. is visiting Japan (the home of the Kaizen Philosophy) for additional training and in-depth observation.